The London Oak Range is a hugely popular and practical range of solid wood (oak external and pine internal) furniture pieces that will not only fit well into any home, they will take pride of place too. With a choice of many pieces to pick from, you are sure to find a piece from the London range to suit all rooms in the home. 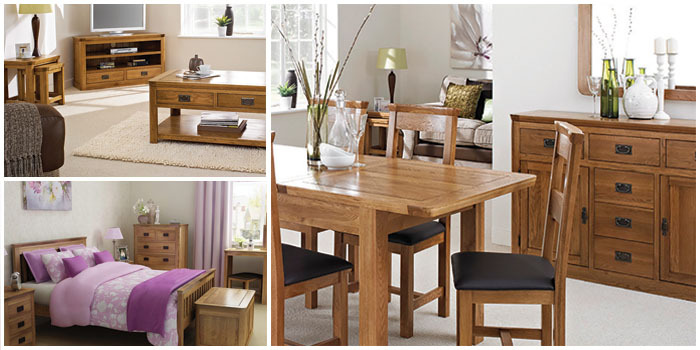 From oak dining furniture to quality solid king size beds and a variety of other pieces, large and small, including sideboards, bookcases and lamp tables, the London Oak Range offers you options in abundance. With the London range, it’s the rustic feel of the oak that first catches the eye and this will ensure that these are pieces of solid wooden furniture that will continue to catch the eye within your home for years to come. It’s no surprise that oak has been popular in furniture production since the middle ages. Oak itself is strong and dense, its rich grain markings are attractive, and as a particularly hard-wearing wood, oak remains perfect for the modern family home. The London Medium Oak Range features 100% solid wood construction (oak external and pine internal) and the pieces benefit from dovetail joints, smooth contoured edges and antique style steel handles. A stylish rustic look is evident on all pieces, and all furniture surfaces in the London Medium Oak range are meticulously lacquered to make them more resistant to spills. For a timeless look of quality that offers practical solutions for the home, look no further than the London Medium Oak Range.